The business scenario for LIS data extraction as explained .Your company uses its own info structure to report on incoming orders according to sales organizations and customers.You are responsible for extracting the data from the R/3 System and transporting it into BW. To do this, you have to create the necessary components in the R/3 and BW Systems.You have to use a delta update mechanism to upload the data. transfer the data to the communication structure in BW. 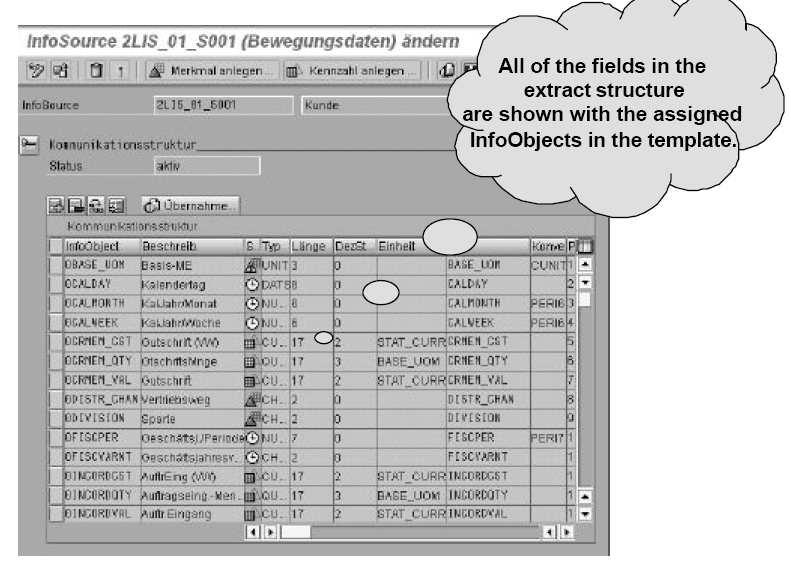 The InfoSource prepares the data for permanent storage in the InfoCube.In addition to the LIS info structure, two additional tables are required as extractors in the OLTP System for the delta upload. Operative transaction data (for example sales orders, billing documents) is stored in application data tables (e.g. VBAK/VBAP for sales orders). When the data is updated in LIS, the information is transferred from an operative document to 'communication structures' (e.g. MCVBAK, MCVBAP).  This information is then written from the communication structures to the corresponding information structures using update rules. 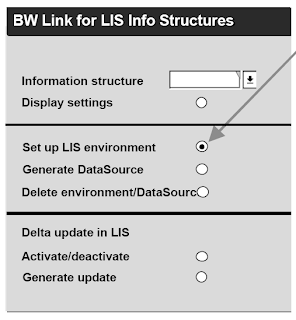 Before LIS info structures can be used as source tables, you have to define several settings. First, you have to configure the LIS environment for the relevant info structures. To do so, choose Administrator Workbench > Modeling > Source Systems (choose the relevant source system and click the right mouse button) > Customizing Extractors. > Generated DataSources > Logistics > Logistical Informatio n System > Attach Information Structures.Alternatively, you can use the transaction SBIW in R/3 or start the report RMCSBIWC. 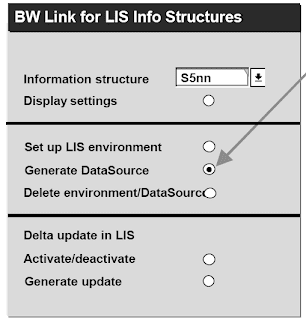 Once the LIS environment has been configured, two transparent tables and one structure are generated for this special info structure.The transparent tables 'S5nnBIW1' and 'S5nnBIW2' (S5nn = customer name range for information structures developed in-house) are used for the delta update in BW (see end of this unit). These tables are identical copies of the information structure.The structure 'S5nnBIWS' is adapted to meet the requirements of BW and is used as an extraction structure. 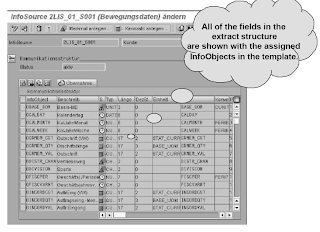 A DataSource must be generated so that the info structures in the OLTP System can be used as source tables for the BW.First, the fields in the extract structure must be assigned InfoObjects. 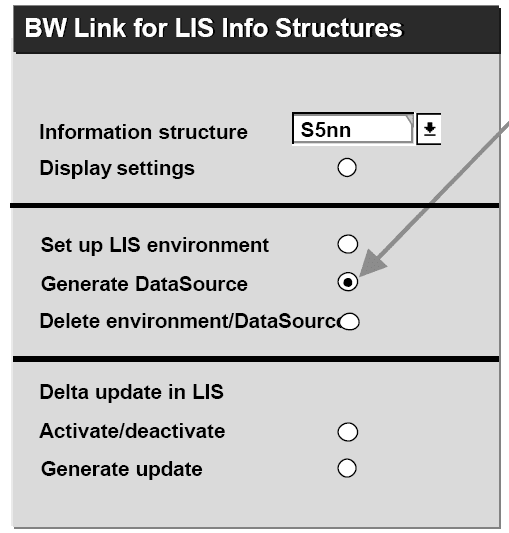 Each time a DataSource is generated for an info structure 'S5nn' in the OLTP System, the DataSource '2_LIS_01_S5nn' is created in the connected BW System.A maintenance screen is displayed in which you can assign other properties to the fields of the extract structure (S5nnBIWS). OLTP extraction tables make up the basis of a DataSource as far as BW is concerned. In some application areas, you can use separate generation tools. DataSources are created from the customer specific information structures in the LIS environment, in this way, an interface is established between LIS and BW. An R/3 System connected to BW provides a variety of DataSources. These can be uploaded into BW by replicating them in the source system tree.The DataSources are delivered in a so-called 'D version' and can be transferred to the 'A version' when they are activated. They can be also changed and forwarded to the 'A version' (one that deviates from the default). If DataSources have changed in the source system (for example, when your R/3 System is upgraded), you can decide if you want to activate them to the 'A version', or continue using the existing ones. The DataSource must be replicated before it can be used in BW. To do this, choose the 'Source Systems' tabstrip in the BW Administrator Workbench. Select the relevant OLTP system and choose Replicate DataSources from the context menu. All the DataSources that do not yet exist in the BW are then transferred from the OLTP to the BW System. 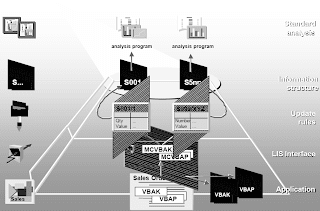 Communication structures are created for InfoSources and thus represent part of an application in the OLTP System (for example, order data from Sales, purchase order data from Purchasing, and so on). The total number of InfoObjects in the communication structure and extract structure may be different, since InfoObjects can be copied to the communication structure from all extract structures (several source systems).